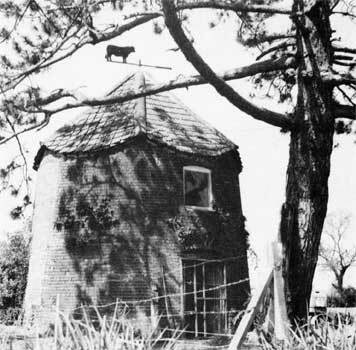 Mattishall tower windmill stood in Mill Road, on the northwest side of the village. The tower was 5 storeys high and built of red brick in 1857-1858 for farmer Matthew Yull. The mill site was originally in Mill Street and was previously occupied by a postmill which Matthew Yull had bought from Richard Sendall in 1840. At some point after the new towermill was built, the road name was changed from Mill Street to Mill Road, possibly at the same time as nearby Town Lane was renamed Mill Street. The new mill was built to produce flour using two pairs of French burr stones, the larger pair being 4' 4" and the smaller pair 4'. Matthew Yull ran the mill from April 1858 but it was advertised as being for sale by his mortgagees two years later. Presumably Matthew Yull came to a financial arrangement with them, as the mill was withdrawn from sale a week later. However, it appears that Matthew Yull then ceased to run the mill himself and took on a tenant. All that piece of Freehold Land containing la. 1r. 25p. 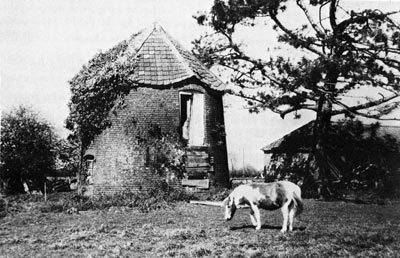 abutting on the road leading from the Mattishall Turnpike to North Tuddenham with the five floor Tower Windmill, excellent Granary, 2-stall Stable, Hay house and Cart shed which have recently been erected thereon in the most substantial manner. The Mill is fitted up in the most complete manner with two pairs of French Stones 4 ft. 4 ins. and 4 ft., new machinery for wind and steam and is now in full work. The Mill and Land are in the occupation of Mr. Matthew Yull and the Cottage of George Wright. Apply to Mr. Dye, Solicitor, St. Andrew's Broad-street or the Auctioneer, 22 Bethel-street, Norwich. The Sale of Freehold Land and newly erected Tower Windmill, Cottage, Granaries and Buildings advertised to take place at the Kings Head Inn, East Dereham on Friday 1st June 1860 IS POSTPONED UNTIL FURTHER NOTICE. Freehold Windmill, Cottage, Land and Premises. A Freehold BRICK TOWER WINDMILL, Granary, Stable, Hay house and Cart shed recently erected in a substantial manner. The Mill is fitted up completely driving two pairs of French Stones with machinery applicable for wind or steam and is now in full work. Also a Dwelling house containing two sitting rooms etc. Also a Piece of Land containing with the site of the buildings 1 a. 1r. 25p. 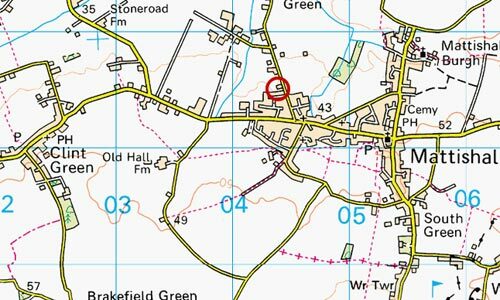 The above is situate next the road from Mattishall Turnpike to North Tuddenham and is now in the occupation of William Murrell who is under notice to quit at Michaelmas next. Apply to Messrs. I. O. TAYLOR & SON, Solrs. Norwich and of the Auctioneers Norwich and Yarmouth. TO BE LET at Michaelmas next a BRICK TOWER WINDMILL with five floors driving two pairs of stones with machinery for driving by steam. Also a small quantity of Land if required. Application for rent and particulars to Mr. Matthew Yull, Mattishall Old Hall, Norfolk. Tues. Nov. 23 John Muskett, Mattishall, Miller. WANTED, a married man without encumbrance to work a Tower Mill. Apply M. Farman, Mattishall, Norfolk. 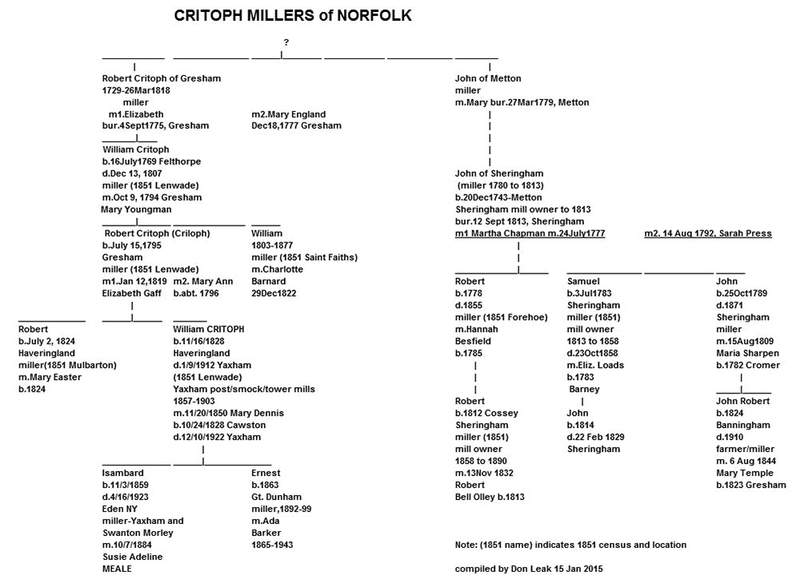 William Critoph was also working Yaxham_towermill in 1883 and he was a descendent of Robert Critoph of Gresham who in turn was probably related to the Critoph milling family of Sheringham and Upper Sheringham. Died on 3rd August, at the Greenhouse, North Tuddenham, George Farman, miller, aged 42. WEATHERALL & GREEN will Sell by Auction at the Kings Arms Hotel, East Dereham on Friday October 25 at 3 precisely, in nine Lots, a capital Brick built FARMHOUSE, Farm Buildings, Cottages, Windmill and about 36 acres of Arable and Pasture and Accommodation LANDS, situate at or near Mattishall, Westfield and Yaxham. Nearly the whole is let to good tenants of long standing at very moderate Rentals. Particulars of Messrs. PONTIFEX, HEWITT & PITT, Solrs. Holburn Circus, London, E. C. and of the Auctioneers, 22 Chancery Lane, London. together with several capital enclosures of Arable and Pasture Accommodation Lands, as now in the occupation of Messrs. Juby, Stevenson and Brown (the mill being in hand) at gross estimated rentals of £61 per annum. The property is principally Freehold and contains altogether about 20 acres. Particulars of the Auctioneer, East Dereham and of the Vendors Solicitors, Messrs. PONTIFEX, HEWITT & PITT, 166 Andrews Street, Holburn Circus, London, E. C.
The mill ceased working around 1890 and after the top section of the mill was blown off c.1893, some of the parts were used by William Lant Duffield to repair his towermill in nearby Mill Street. Mr. Duffield said (1948) Mill Road mill was a 5-floor tower, run by Youll. 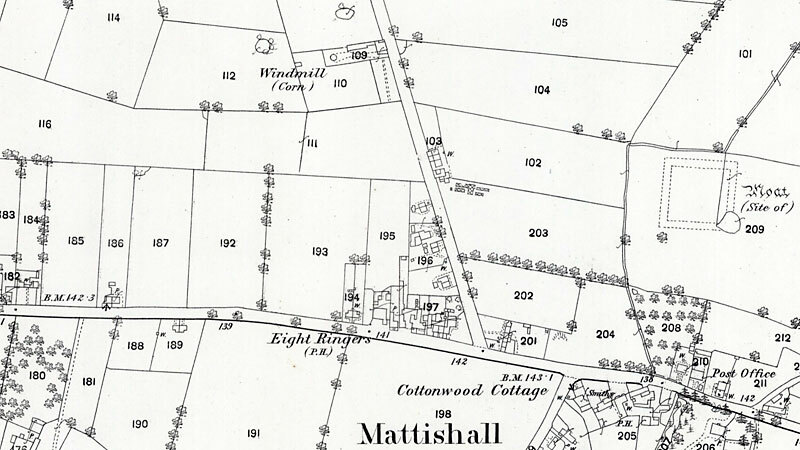 Says top blown off a short time before he went to Mattishall (1893) and he bought some of the materials to repair his. (Mill_Street_mill). Present house, Ivydene, Mill Road, built by Lebbell King for Isaac Fisher c.1890-95. Mill out of action by then. Isaac Fisher died 1931 aged 65. Mill dismantled c.1900. Now a 2 storey stump, 6 sided tiled roof. On beam, ground floor:- W. W.
Broken peak stone in garden.